Free admission and lots of delicious free samples! Every hour throughout the weekend, between 11:00am and 5:00pm, a different chef from a local Italian Restaurant will be featured on the Galbani® Great Italian Chefs Cooking Stage, located on the Fisher Terrace — the rooftop of the Fisher Pavilion. Sponsored by Galbani and presented by Isernio’s Sausage and Merlino Foods. Additional tour support provided by the Mediterranean Inn. Over the years we have had demos from chef’s representing such local restaurants as: Café Juanita, Tulio, il Fornaio, Il Terrazzo Carmine, Café Bengodi, Serefina, Assaggio, etc. Some of their recipes can be found in our online Recipe Collection. Please check the main schedule page for information about this year’s line-up. 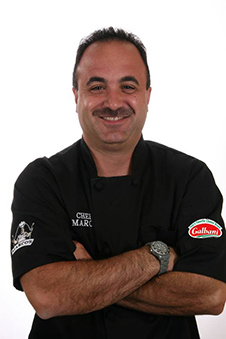 Galbani’s celebrity Chef Marco Sciortino 3:00pm, Saturday and Sunday.